"Loving #SuperiorDonuts @LyricArtsAnoka! Smart, funny, relevant play by #TracyLetts and great cast! And it's nice to see some diversity on the stage and in the audience. #intermissiontweets." Sometimes 280 characters is all you need. But I've got a few more here, so I'll expand on last night's intermission tweet. 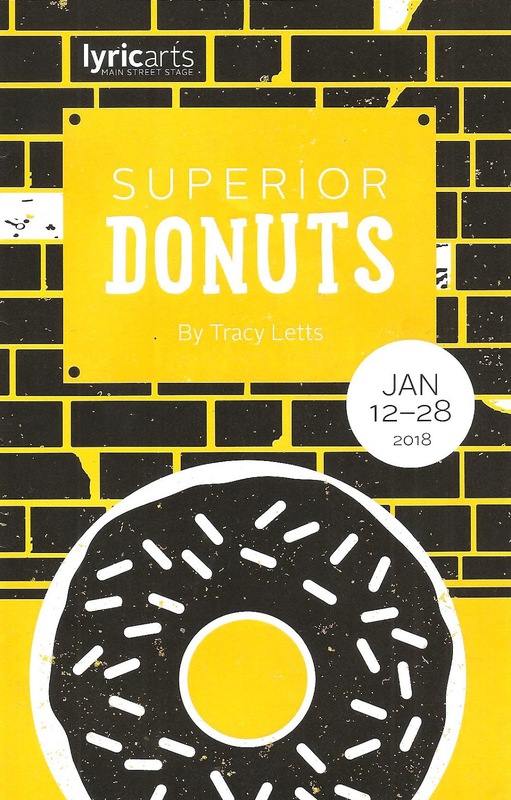 Lyric Arts' production of Tony and Pulitzer Prize winner Tracy Letts' Superior Donuts, which premiered at Chicago's Steppenwolf Theater ten years ago, is one of the best things I've seen there. I almost always enjoy my trip to Anoka to see theater at Lyric, but my biggest complaint has been the lack of diversity on the stage at this theater in the 'burbs that only recently transitioned out of being a community theater. This play is a great step in the right direction, a new-ish play by a current acclaimed American playwright. And this cast is fantastic, really bringing out the heart and humor of the piece. Friends, if you've not been to Lyric lately, now is the time to head up Highway 10 to the old movie theater on Main Street (it's not as far as you think). At its heart, this is a story about friendship, about community, about a neighborhood of diverse people banding together. In Chicago's Uptown neighborhood, Arthur runs the family donut shop that his Polish immigrant parents opened 60 years ago. But he's not very enthusiastic about it. Since his wife and daughter left him five years ago, and then his wife died more recently, he's been depressed. More interested in smoking weed than selling donuts, sometimes not even opening the shop at all. All that changes when a bit of new energy and spirit is injected into the shop and Arthur's life, in the form of new employee Franco, a young black man from the neighborhood who's an aspiring writer in need of some fast cash. The two men from different backgrounds and generations become friends despite (or because of) the fact that they challenge and sometimes annoy each other. When Franco's debts come calling, Arthur reaches out a helping hand and the neighborhood pulls together in an example of Langston Hughes' "America will be!" Lyric has assembled a great cast of familiar faces and newcomers to the Main Street stage, and director Matt McNabb gets fine performances from all of them, neatly balancing the comedy, tension, and poignant emotions of the piece. The two leads are terrific, both individually and as a pair. Jeffery Goodson is pitch perfect as Arthur, a sad sack yet sympathetic man, motivated by friendship to make a change and move forward. Playing Franco is a young actor I'll be keeping my eye on. I first saw Malick Ceesay in an impressive turn in Underdog Theatre's Fringe show Odd Man Out last summer, and he's great here too - funny and natural and heart-breaking. 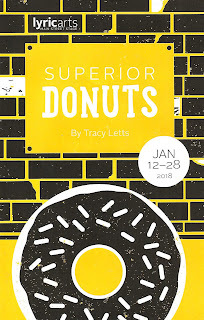 The world of Superior Donuts is populated by a quirky cast of characters (it's not surprising this play has been turned into a sitcom, which I'm now curious to see), with a strong supporting cast filling the roles. Peter Aitchison provides comic relief as Russion neighbor and business owner Max. A couple of friendly neighborhood cops are portrayed by the always wonderful Jamie White Jachimiec (who's delightfully awkward as Arthur's potential love interest) and Richard "Doc" Woods; Martha Wigmore finds the humanity in the local alcoholic homeless woman Lady; Bill Williamson is scary good as the man to whom Franco owes money, with a quietly menacing air; and Tyus Beeson and Timothy Johnson round out the cast as a couple of imposing toughs. Speaking of, the second act includes a lengthy and realistic fight scene (Aaron Preusse fight director), sadly with many donuts becoming casualties. Gabriel Gomez's scenic design creates a realistic donut shop that's past its prime (with a working sink and coffee pot! ), in various states of disarray throughout the play. Jim Eischen's lighting design takes us from morning to night, with interesting shadow effects. A single spotlight illuminate Arthur during his occasional monologues, in which we learn more about his life, family, and time as a draft evader in the '60s. This is not a short play, coming in at close to three hours, of which I'm typically not a fan (I live for 90-minute no intermission). But in this case, the play never felt long, and I relished every moment spent in the donut shop with these quirky, flawed, human characters. Superior Donuts is smart, funny, scary, poignant, and takes us through the highs and lows of life, finding joy in simple companionship. It's lovely to see a story about people of different races, cultures, generations, and opinions working together and being a community. This short run closes on January 28, so hurry on up to Anoka before you miss the chance. More info can be found here, with discount tickets available on Goldstar.